This sample shows how Paris can be used across all industries to print checks. Despite advances in electronic payment methods, physical checks are still required for some applications. Although special paper is required for certain security properties, Paris can be used to automate and streamline the production of checks by printing the entire check including signatures and MICR line. 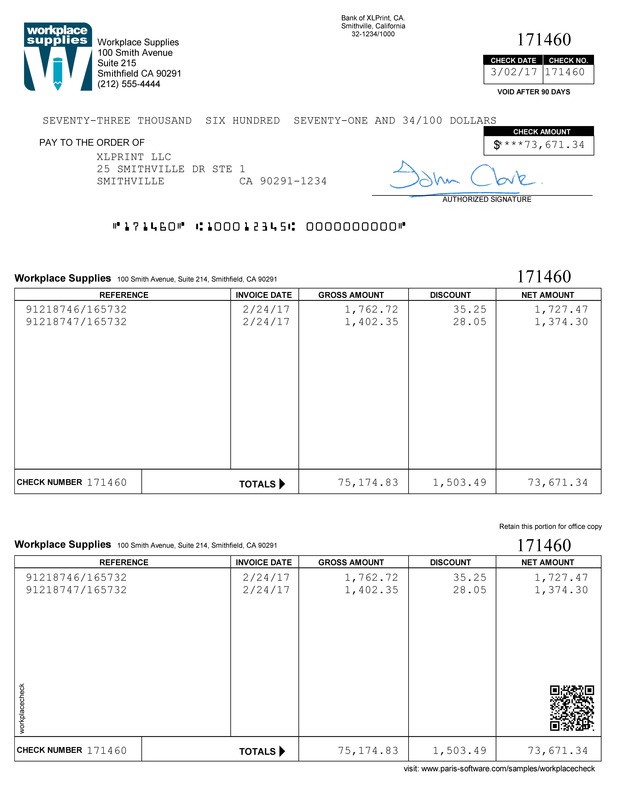 In this example, we are are printing the entire check on to plain check stock with the overflow page being printed on plain paper from another tray. The signatures are being included at print time to save having to run through a signing machine (or manual signing) and can be changed by account, amount etc. The MICR line is being generated and positioned at print time requiring un-encoded check paper and eliminating the need to match start and end check numbers after printing. Check detail overflow (when the check details need to be printed over more than one page) can be printed on plain paper, creating further savings and decreasing security exposure.